The CGIAR Research Program on Forests, Trees and Agroforestry (FTA) recently cohosted a fruitful meeting along with the CGIAR Research Program on Climate Change, Agriculture and Food Security (CCAFS) and the CGIAR Research Program on Water, Land and Ecosystems (WLE) on the topic of soil carbon. “Soil carbon — the ‘carbon beneath our feet’ — could help mitigate significant greenhouse gas emissions, while also supporting food production and adaptation to climate change,” Lini Wollenberg (CCAFS), Christopher Martius (FTA), Keith Shepherd and Rolf Sommer (WLE) emphasized following the webinar. “As such, soil carbon could be crucial to meeting the Paris Agreement goal to limit global warming to below 2 degrees and Sustainable Development Goals related to food security and climate. However, we still lack the knowledge needed to sustainably manage soil,” they added, taking into account that carbon sequestration is an important cobenefit to other productive and ecological functions of healthy soils. Soil organic carbon (SOC) is a key component of many essential soil functions, including food production, habitats and biodiversity, carbon storage, as well as water storage and filtration. Climate change is also altering the picture. The global 4p1000 Initiative and the Food and Agriculture Organization of the United Nations’ Global Soil Partnership are among current efforts to overcome this knowledge gap. The webinar aimed to build a common understanding of CGIAR’s current soil carbon research and inform a vision and coordinated agenda. Thirty CGIAR scientists, representing seven CGIAR Centers and six CGIAR Research Programs, exchanged research findings and identified priorities for a future research agenda on soil carbon and climate change. FTA scientist Tor-Gunnar Vågen presented on soil organic carbon during the recent webinar. 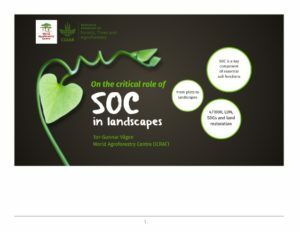 In particular, scientists discussed the role of SOC in landscapes, and the need to estimate SOC across landscapes, while traditional work is by essence based on plot-level measurements. FTA scientist Tor-Gunnar Vågen of the World Agroforestry Centre (ICRAF) cited the Land Degradation Surveillance Framework (LDSF), which was developed by ICRAF following years of research on land degradation and ecosystem services, as well as CGIAR and FTA’s sentinel landscapes, before highlighting the vital important of context in assessing SOC. “The scientists will take steps to support coordination of [soil carbon] research across CGIAR Research Programs in ways that make use of our extensive network of field sites and large knowledge base on sustainable agricultural practices, while also recognizing the broader ecosystem functions of soil carbon and seeking to improve understanding of the benefits and trade-offs of soil carbon sequestration,” confirmed Wollenberg, Martius, Shepherd and Sommer. Moving forward, FTA, CCAFS and WLE will coordinate relevant research by involving different strategies for soil carbon management across all land covers and uses, from cropland to pastures, agroforestry, trees outside forests, and forests, by providing solutions on best practices, management and policy, as well as the measurement of impacts. 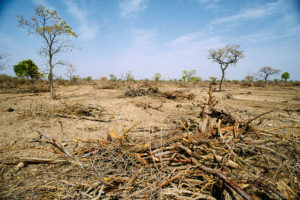 The programs will also consider how soil carbon preservation and enhancement objectives can provide important co-benefits to other objectives, such as conserving, rehabilitating or restoring land, and the sustainable intensification of agriculture, for which trees provide an important solution, as FTA work will inform. By Vincent Gitz, Christopher Martius and Hannah Maddison-Harris.